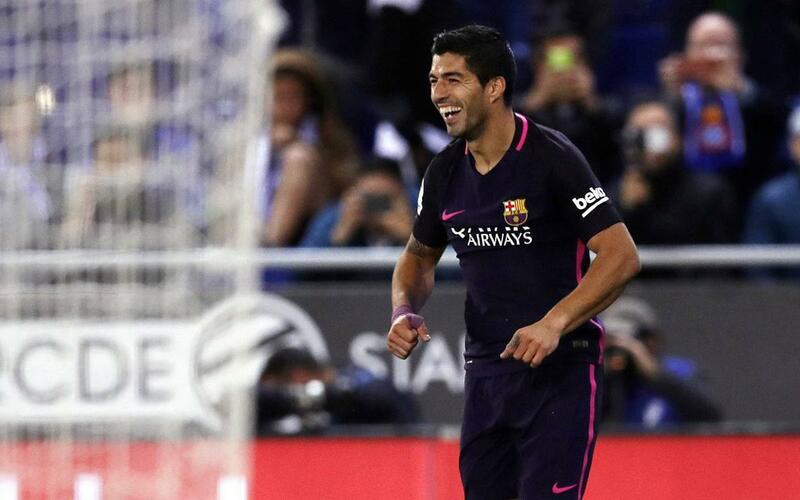 FC Barcelona scored three second-half goals — with two coming from Luis Suárez and one from Ivan Rakitic — to run away with a clutch, 3–0 victory at cross-town rivals RCD Espanyol, in Saturday night’s Catalan derby. The victory keeps Barça in first place in La Liga, even on points with Madrid but ahead on goal difference. Barça, which had a lot more to lose than Espanyol had to gain, were held scoreless in the first half and, mindful they were in a must-win situation, were desperate to find the net to keep from seeing their La Liga title hopes dashed less than a week after taking over first place on an epic, last-gasp goal at Real Madrid. Barça’s win extends their league derby undefeated streak to 16 games, including 13 victories and three draws. While matches between Barça and Espanyol are always wild cards, the feistiness of Los Periquitos was par for the course as far as derbies go, fueled in part by the relentless battle cries of the home fans. Physicality was a hallmark throughout, but especially so early in the game. By the end of the first half, Sergi Roberto, Neymar, and Ivan Rakitic had all been felled to the turf in hold-your-breath-moments. Neymar, looking especially vigorous after a three-game rest, broke free and had a shot in the 12th minute, but it was blocked in front by an Espanyol defender. The Brazilian spent most of the first half stepping over and around defenders as if they were merely an inconvenience, though he was unable to get close enough to the Espanyol net to give Barça any truly menacing chances. But five minutes after the break, in minute 50, Suárez broke through to give Barça a lead they would not relinquish. With Espanyol working on a buildup to get the ball into the Barça half, Espanyol midfielder José Manuel Jurado sent an errant pass back towards his own area. Suárez pounced, sensing the miscue right away and galloping in to steal the ball before firing a low shot with the outside of his right foot. Suárez buried the ball inside the post to the right of goalkeeper Diego López. At the other end, Barça goalkeeper Marc-André ter Stegen did not have the busiest of nights, but he did make a fine save in the 70th minute on a wicked shot by Jurado that stayed low to the ground. It was one of the very few times Espanyol created even a semblance of danger in the second half. Ter Stegen went on to pick up a clean sheet, Barça’s fifth in a row at Espanyol in La Liga, a Club record. But with Barça up 1–0 and monopolizing the ball more and more with each passing minute, there was a feeling they might put up another one. In the 77th, Ivan Rakitic finished at the end of an odd-man rush led by Leo Messi, who took a pass from Neymar and rolled the ball through the top of the area. The cross would have found multiple Barça players creeping into the area, but the first was Rakitic, who sent a well-placed low shot back across the goal mouth, freezing López on his line, and nestling the ball softly into the net. Suárez’s second goal of the night came in the 86th, on yet another Espanyol slipup, this one by Aaron right in front of his own goal, allowing Suárez volleyed in from the doorstep.